SPRING, TEXAS (March 30, 2017) — Woodbine Development Corporation (Woodbine), in partnership with CDC Houston and USAA Real Estate Company (USAA RealCo), broke ground on Marriott CityPlace at Springwoods Village in Spring, Texas. The 10-story, 337-room full-service hotel anchors the eastern end of CityPlace, a 60-acre fully integrated, mixed-use district in Springwoods Village, facing CityPlace Park and next to the public CityPlace Plaza. The property is scheduled to open in November 2018. Woodbine is the developer and asset manager for the Houston-area hotel. Gensler is the architect and designer, and Austin Commercial is the general contractor. Financing is being provided through a partnership between Commerce Bank and Frost Bank. 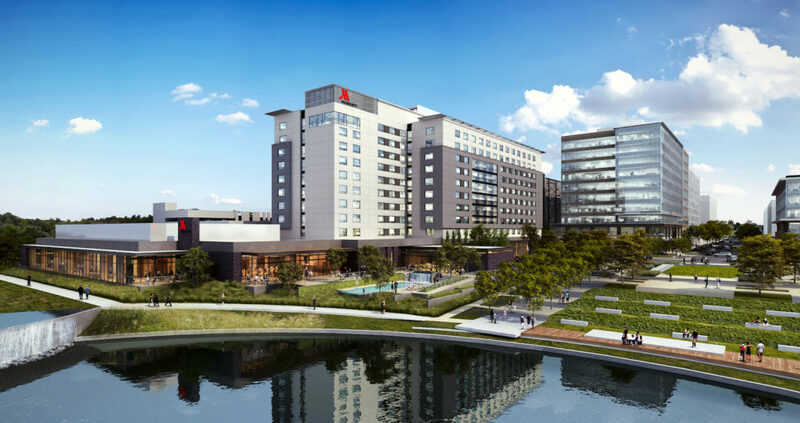 Marriott CityPlace at Springwoods Village will be the first full-service hotel within the master-planned community. In addition to Marriott signature elements, such as MClub Lounge, Great Rooms, Great Room Bar and Grab N Go, the hotel will also include a three-meal-a-day restaurant and a tech lounge. The pool, pool bar and spacious outdoor patio and event space will allow travelers to take advantage of the Texas sunshine and fair weather. The hotel will also be host to 33,000 square feet of indoor/outdoor function space, including a grand ballroom, a junior ballroom, five meeting rooms, a boardroom, a pool bar event space and an expansive outdoor event area. Marriott CityPlace at Springwoods Village will have an open feel and contemporary design informed and inspired by the meandering paths, forest trails and flowing creeks of the surrounding Springwoods Village community. The handsome interiors will feature a mix of stone, tile, wood, metal and textured fabrics in natural and earthy hues—paired with upscale furnishings, fixtures and finishes. Nods to the history and nature of the region will be woven throughout. Public spaces will reflect the needs of today’s travelers—providing a mix of inviting configurations and seating options for those looking to connect online or to connect with others around them. Meanwhile, the 337 guest rooms will offer modern, restful retreats, with comfortable lounge furniture and a flexible table/work station setup that allows for seamless transitions between work and relaxation. The design of Marriott CityPlace at Springwoods Village has been developed with the goal of pursuing LEED certification, reflecting Springwoods Village’s commitment to sustainable development and conservation. Guests will be able to enjoy the community’s natural assets, including more than 290 acres of parks and natural corridors that connect to a network of trails. The nearby 150-acre Springwoods Village Nature Preserve is an ecologically rich experience with a forest habitat, wetlands and pond, and will eventually become part of the greater 46-mile Spring Creek Greenway. Springwoods Village is a $10 billion, 2,000-acre sustainable master-planned community coming to life in Spring, just south of the Woodlands and 20 miles north of downtown Houston. Located at the confluence of I-45, the Hardy Toll Road and the Grand Parkway, the community is a new model of sustainability and greener living for the Houston region, preserving its natural ecosystems, building energy smart homes, and reducing dependence on the car by providing a walkable mix of retail, dining, offices and public amenities. CityPlace, which will offer 4.4 million square feet of office and retail space within Springwoods Village, is being developed by a master development venture comprising Patrinely Group, USAA Real Estate Company and CDC Houston. Proximity to companies like ExxonMobil, Southwestern Energy, American Bureau of Shipping, HP, Inc. and CHI St. Luke’s hospital will allow residents, employees, visitors and those doing business with these companies to enjoy convenient access to the Marriott CityPlace at Springwoods Village as a preferred destination for the community at large. CDC Houston, Inc. (a subsidiary of Coventry Development Corporation [New York]) is an experienced land developer with expertise in creating mixed-use urban communities that foster smart and responsible growth for commercial and residential vitality. Coventry has provided development services for mixed-use projects in New York, Colorado, Texas and Guam over its 45-year history. In 2001, the company launched RidgeGate, also a sustainable, mixed-use community, in Lone Tree, Colorado, which consists of 3,500 acres. For information on CDC Houston, Inc.’s largest project, Springwoods Village, please visit: www.springwoodsvillage.com and connect on Facebook and Twitter. USAA Real Estate Company, with over $17 billion in assets under management, provides co-investment, acquisition, build-to-suit and development services for corporate and institutional investors, and arranges commercial mortgage loans on behalf of affiliates. The portfolio consists of office, industrial/logistics, multi-family, retail and hotel properties. USAA Real Estate Company is a subsidiary of USAA, a leading financial services company, serving military families since 1922. For more information, visit www.usrealco.com.